REUTERS/China DailyMicrosoft CEO Satya Nadella. Depending on which research report you read, the Windows Phone operating system only has about 3% to 5% of the global smartphone market. Microsoft may have (laughably) passed BlackBerry, but its grip on the smartphone market is still teeny tiny compared to Android’s 80%+ share and iPhone’s ~12% share. But that doesn’t seems to bother Microsoft CEO Satya Nadella. He looks forward to the next version of Windows, Windows 10, which will run on all devices ranging from phones to tablets to big-screen TVs. In other words, Windows Phone is just a touch point into the broader Windows ecosystem, which will get a major upgrade next year with Windows 10. There are already over 1 billion devices running Windows, and soon Windows Phone will be lumped into that. 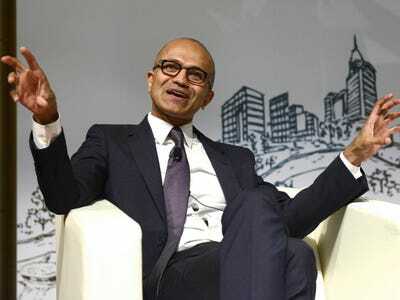 Nadella also admitted that Windows’ strength is still in big-screen devices like desktops, laptops, and tablets. But he thinks Windows 10 will help drive people buying Windows computers and other devices like the new fitness band to buy Windows Phones, too.